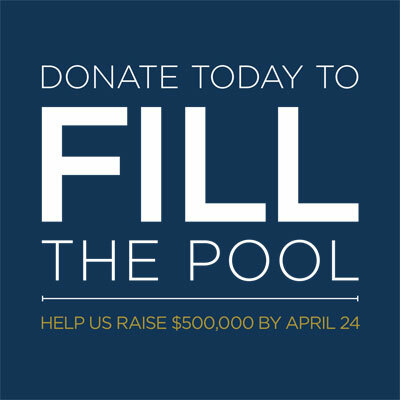 EL SEGUNDO, Calif.-- South Bay Sports, Health and Recreation announced today that the El Segundo Aquatics Center is kicking off the “Fill the Pool” spring community fundraising initiative to raise $500,000 towards the completion of the world-class facility. The three-week fundraiser will run from April 4 th until April 24 th , and proceeds are part of the effort to help raise the final $3 million still needed for the project. The facility is scheduled to break ground on Thursday, April 27, where the total from the “Fill the Pool” fundraiser will be announced. “The ‘Fill the Pool’ initiative is an exciting campaign designed to encourage the public to help us reach our long-term goal,” said Richard Lundquist, CEO of the non-profit organization South Bay Sports, Health and Recreation. “We hope to raise half a million dollars of our overall goal of $6 million prior to the groundbreaking late this month, and we cannot do it without generous donations from the residents and businesses in the area.” Earlier this year, to commemorate El Segundo’s centennial, Lundquist’s company, Continental Development Corporation, made a second $1 million contribution to the center representing $10,000 for each year that the city has been incorporated. As a Thank You Gift for “filling the pool”, donors can choose from a number of exclusive, limited edition El Segundo Aquatics items on the newly revamped website. Items correspond with $50 to $1,000 donations and include hats, towels, bags, personalized pavers, names on the donor wall and one- to ten-year Sponsorships. The Aquatics Center also launched Facebook and Instagram pages to inform the community and attract supporters. The outdoor swimming complex will provide the community with a center for competition-level swimming, community swim lessons, and fitness classes and will act as the future home to local high school and adult swim and water polo teams. Both Wiseburn High School and El Segundo High School will utilize the facility, with El Segundo Recreation and Parks managing city-run programs. Contributions to the El Segundo Aquatics Center will also benefit the 76-year- old Urho Saari Swim Stadium, better known as The Plunge. With so much demand for time and necessary construction and repairs needed at The Plunge, many residents have not been able to take advantage of the community pool. The new Aquatics Center will allow The Plunge to be closed temporarily in order to renovate the facility with minimal or no disruption to the ongoing swim programs. “After The Plunge is reopened, the addition of the Aquatics Center quadruples the pool size in El Segundo,” said Mayor Suzanne Fuentes at the kick-off event for the facility in 2016. To date, major donors of the Aquatics Center include Kinecta Federal Credit Union, The Los Angeles Lakers Foundation, Los Angeles County – 4 th District, Skechers, Chevron El Segundo Refinery, Mar Ventures, Toyota Motor Sales, U.S.A., and Continental Development Corporation. To donate, visit DonateESAquatics.com or email Sherry Kramer, Continental Development’s Community Affairs Director at skramer@continentaldevelopment.com. South Bay Sports, Health and Recreation is a not-for- profit corporation dedicated to providing funding to create, upgrade, and enhance sports and recreation facilities with the purpose of promoting and cultivating improved health for the betterment of the community. Visit DonateESaquatics.com or sbshr.org to learn more.